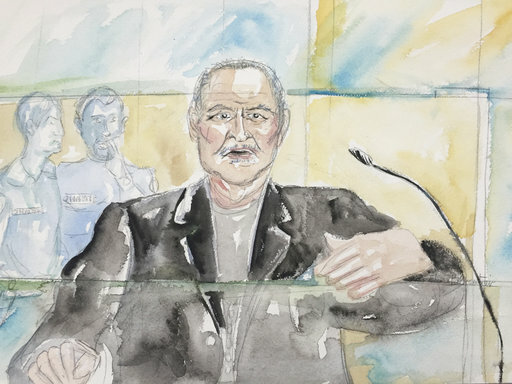 PARIS (AP) — A French court on Tuesday convicted the man known as “Carlos the Jackal,” once the world’s most-wanted fugitive, of a deadly 1974 attack on a Paris shopping arcade and sentenced him to life in prison for the third time. The Venezuelan-born Ilich Ramirez Sanchez is already serving two life sentences in France for murders and attacks he was convicted of perpetrating or organizing on behalf of the Palestinian cause or of communist revolution in the 1970s and ’80s. His lawyers, who had pleaded for acquittal, said they will appeal the latest verdict, though the third life sentence doesn’t affect how long he will stay behind bars. A few hours before the decision was returned, the 67-year-old known worldwide as Carlos took the floor one last time and denounced “an absurd trial” for a 42-year-old crime. He had denied involvement, saying there was no proof against him or direct witnesses. Five judges found Carlos, the only defendant in the case, guilty of throwing a grenade onto a shopping area in the French capital’s Latin Quarter. Two people were killed and 34 injured at the trendy Drugstore Publicis. The case took so long to go to trial because it was first dismissed for lack of evidence. It was reopened after Carlos was arrested by French intelligence services in Sudan in 1994 and imprisoned in France. His lawyers introduced challenges at every stage of the proceedings. After the verdict was returned, one of Carlos’ lawyers, Francis Vuillemin, argued the trial should never have been held because the case was beyond the normal statute of limitations. “The media truth has permeated the judicial truth. The magistrates didn’t dare acquit Carlos. Let’s meet again in one year, for the appeal trial and for a new performance in this justice drama,” Vuillemin added. The Drugstore case, the oldest one formally blamed on Carlos in France, is also probably the last one to come to court, since he is not being investigated by French authorities for any other attacks. When the police arrived at the scene on that day in September 1974, they found a devastated mall with all the windows shattered, multiple bloodstains and a hole in the marble slab of the ground floor where the grenade fell. The two men who died were hit by metal chips that perforated vital organs and caused large internal bleeding, according to court documents. In a long interview published in Al Watan Al Arabi newspaper five years after the attack, a man presented as Carlos allegedly claimed he had himself thrown the grenade, telling the full details of the operation and the reason why it was carried out. Carlos later disputed he had ever given that interview. At the time of the attack, Ramirez Sanchez had not yet been dubbed Carlos the Jackal or become one of the most notorious international terrorists of those decades. He was 24 years old and already had joined the organization Popular Front for the Liberation of Palestine. In one of his most dramatic operations, he led a commando that attacked a meeting of the Organization of the Petroleum Exporting Countries in Vienna, Austria, in late 1975. He took more than 60 hostages, including 11 OPEC ministers. Three people were killed.